When Megyn Kelly released the 90-second promo for her interview with controversial media figure Alex Jones, the pushback was immediate. Relatives of people killed in the 2012 Sandy Hook shooting -- which Jones has called "a hoax" -- sought to publicly shame Kelly via Twitter. Bill De Blasio, the mayor of New York, said the network should "pull the segment." And reports have surfaced that J.P. Morgan Chase asked NBC to pull its advertisements during the episode. Nevertheless, NBC is planning to air the interview on Sunday, and the show's executive producer is asking viewers to withhold judgment until then. "Until you see the full program, in the full context, I wouldn't judge it too much," Liz Cole, the executive producer of "Sunday Night with Megyn Kelly," told CNNMoney. "Judge it when you see it. Megyn does a strong interview. We're not just giving him a platform." "Giving him a platform would mean he goes unchallenged, and that's not the case in any way," Cole said. "Where is he getting these theories and this information?... Viewers will see Megyn do a strong interview where she challenges him appropriately... That's the benefit of putting him out there. When someone actually sits down and asks him questions and he has to come up with answers -- there's value to that." Jones is certainly influential. 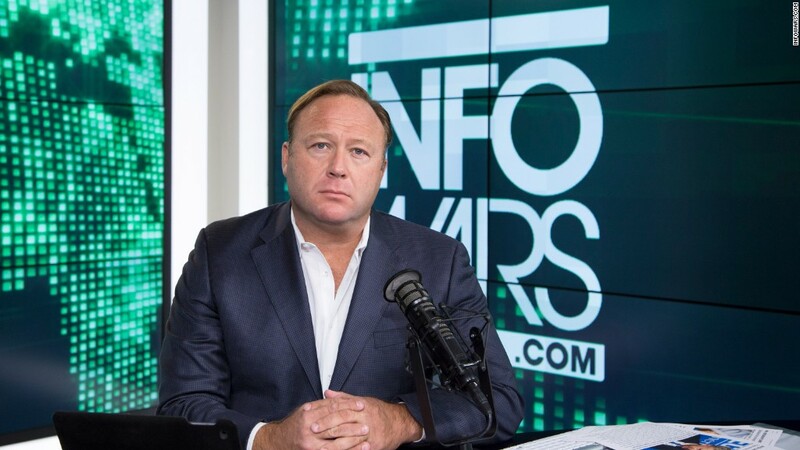 His radio show reaches millions of listeners every day and his website, Infowars.com, had more than 5 million unique visitors in the month of April, according to Quantcast. Jones has also claimed, without protest from the White House, that President-elect Donald Trump called to thank him after the election. To many people, Jones' views are not only baseless but reckless, offensive and downright weird. In addition to his claims about Sandy Hook, Jones also believes 9/11 was "an inside job" and that humans have been "creating animal-human hybrids" for the last 30 years -- all of which he says in his interview with Kelly. "He's a controversial figure for sure," Cole said, "but as journalists it's our job to interview newsmakers and people of influence no matter how abhorrent their views may be." Following the release of the promo, relatives of some of the people killed in the 2012 Sandy Hook shooting called on Kelly and NBC to pull the interview. Nelba Márquez-Greene, whose daughter was killed in the shooting, tweeted several photos of her daughter and wrote, "Here you go @megynkelly - her name is Ana Grace Márquez-Greene. Say her name- stare at this & tell me it's worth it." "This piece of actual garbage encourages people to call my mom's death a hoax and harass other Sandy Hook families," wrote Cristina Hassinger, the daughter of the school's principal. "Shame on you @megynkelly." On Monday afternoon, Mayor De Blasio weighed in as well: "Trump may promote Alex Jones, but NBC News shouldn't give a platform to someone who claims 9/11 & Sandy Hook were hoaxes. Pull the segment." Then, on Monday night, The Wall Street Journal reported that J.P. Morgan Chase had decided to pull its advertisements from Kelly's show until after the segment aired. A representative from J.P. Morgan declined to comment. Also on Monday night, an anti-gun violence organization founded by Sandy Hook parents announced that it had dropped Kelly as host of an event it is holding in Washington, D.C., this week. "Sandy Hook Promise cannot support the decision by Megyn or NBC to give any form of voice or platform to Alex Jones and have asked Megyn Kelly to step down as our Promise Champion Gala host," Nicole Hockley, the group's co-founder and managing director, said in a statement. "It is our hope that Megyn and NBC reconsider and not broadcast this interview." "I understand and respect the decision of the event organizers but I'm of course disappointed that I won't be there to support them on Wednesday night," Kelly said in a statement. "I find Alex Jones's suggestion that Sandy Hook was 'a hoax' as personally revolting as every other rational person does," she continued. "It left me, and many other Americans, asking the very question that prompted this interview: how does Jones, who traffics in these outrageous conspiracy theories, have the respect of the president of the United States and a growing audience of millions? President Trump, by praising and citing him, appearing on his show, and giving him White House press credentials, has helped elevate Jones, to the alarm of many. Our goal in sitting down with him was to shine a light - as journalists are supposed to do - on this influential figure, and yes - to discuss the considerable falsehoods he has promoted with near impunity." Meanwhile, Jones himself has called on NBC to pull the interview, but for a different reason. On Monday he claimed, without evidence, that NBC had used "deceptive editing" to make him look like a monster.